A little boy went missing from the northwest side on Saturday morning. SAN ANTONIO — UPDATE: SAPD says that the missing child was found safe with his mother. San Antonio police are looking for a little boy that went missing from the city's northwest side on Saturday morning. Investigators believe the child is in danger. SAPD said the 5-year-old boy named Sylis McClendon went missing from the 8800 block of Boise Hills Drive just before 10 am Saturday. The child is white with blue eyes and dirty blond hair. He was last seen wearing a gray t-shirt and khaki cargo shorts. 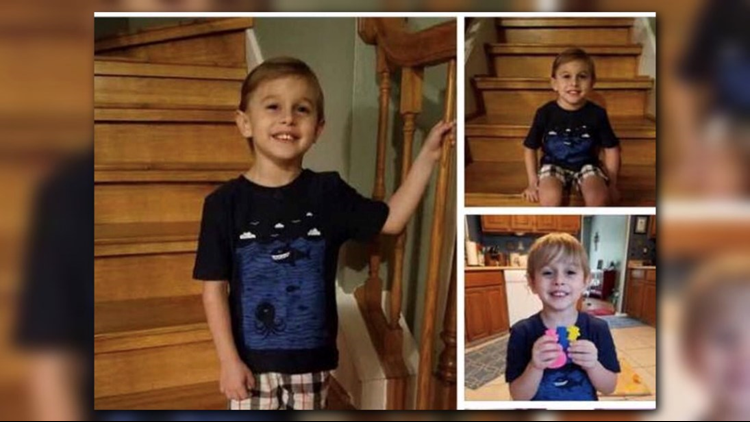 Investigators said the child and his older brother were dropped off at the location of his biological dad's house on Boise Hills Friday evening by his biological mother. The father was out of town, but there were two adults at the home when the kids were dropped off. SAPD was contacted at 10 am Saturday about the younger child missing. There are no signs of forced entry, according to police. Officers have been unsuccessful at contacting the mother. If you have any information on the child's whereabouts contact SAPD's missing person's unit immediately at 210-207-7660.